Famous holistic author, naturopath and researcher Ann Boroch was found dead in Los Angeles on Thursday, as the community of physicians seeking to operate outside the confines of Big Pharma continues to be decimated. She was 51. Ann Boroch, the author of Healing Multiple Sclerosis and The Candida Cure, was famous for curing herself of multiple sclerosis at the age of 24, and remaining symptom free for over two decades. Boroch was also outspoken on many issues including the dangers of vaccination, and she was actively campaigning for people to take control of their lives and reject Big Pharma’s crippling products in favor of natural healing. She believed that education is the most important tool to heal your mind and body. Her sudden and unexpected death has left her family and supporters in such a state of shock that her cousin Lisa had to confirm on Facebook that the news was unfortunately correct. “It is with a heavy heart we share with you that Ann Boroch, passed away suddenly on Tuesday, August 1, 2017. 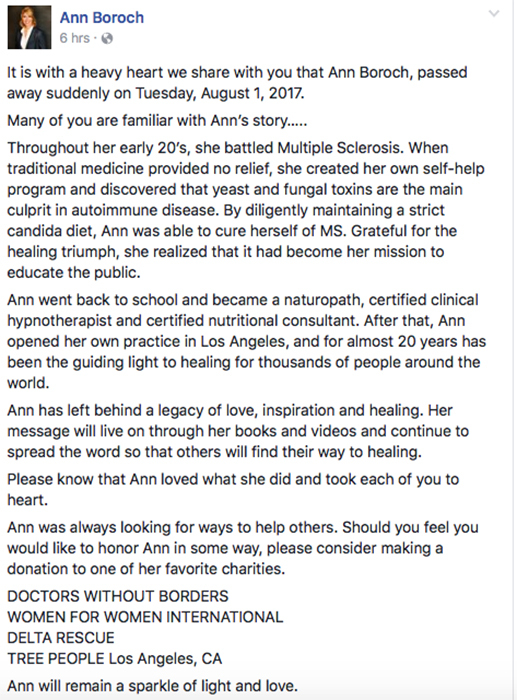 Many of you are familiar with Ann’s story…..
“Throughout her early 20’s, she battled Multiple Sclerosis. When traditional medicine provided no relief, she created her own self-help program and discovered that yeast and fungal toxins are the main culprit in autoimmune disease. By diligently maintaining a strict candida diet, Ann was able to cure herself of MS. Grateful for the healing triumph, she realized that it had become her mission to educate the public. A selection of Ann Boroch’s published works. Over 60 holistic doctors and researchers have been found dead in the past 18 months, most of whom died in suspicious and unsolved circumstances. Check out some of Ann Boroch’s TV appearances below. Her decades of study meant she had much wisdom to share.